Despite several desperate (and mostly ludicrous) moves on A’s part, “Now You See Me, Now You Don’t” felt pretty lackluster for a summer finale. 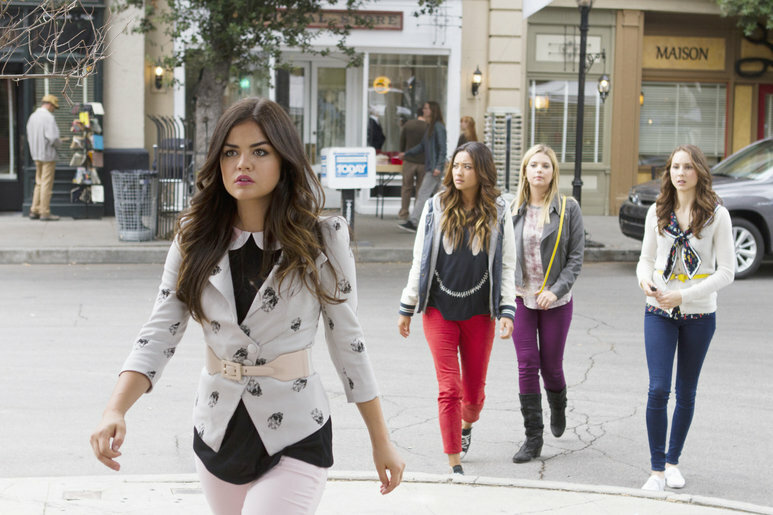 For the episode’s first half, the liars did what they do best: repeatedly receive increasingly violent threats from A whilst standing around panicking together. Because involving the police is out of the question (why is that, again? ), the girls enlisted themselves, as well as Toby and Caleb, to put a stop to A’s newest murder plan. Oh, and don’t even get me started on that “cliffhanger.” A’s not the only one getting desperate, it would seem. After a few obvious allusions to Aria’s poor compatibility with good guy Jake (he doesn’t like poetry readings–to be fair, who does?–and falls asleep to old black-and-white movies–again, who doesn’t? ), Aria sought the company of her former lover and current teacher Ezra post-poetry reading. As the pair chatted happily on the coffee shop’s couch, Aria leaned forward and planted a surprise kiss on Fitz’s lips. Um, guys? This is, once again, ILLEGAL. And you’ll only be right back where you were at the beginning. (Sorry; I’m just feeling particularly bitter about that ending.) Go ahead, Ezria, flaunt your forbidden love in a public coffee shop. And don’t mind that red-coat-wearing blondie spying from the window; she’s only a guaranteed lunatic and potential murderer. Though Toby went AWOL after last week’s hoedown, he’d only really been crying over a box of his mother’s things in his apartment. (I guess Spencer–who spent numerous phone calls looking for her runaway boyfriend–forgot to look there.) When Toby stumbled across some news indicating Wren and Melissa were once again living together, he finally gave Spence a call. Then, he gave her some horribly weak excuse about being in town for her, when he once would’ve fled altogether! Maybe this would’ve been a more acceptable excuse if, say, Toby actually informed Spencer he hadn’t skipped town? Couldn’t he have just been all, “I need some space” instead of going radio silent? Anyway, Spencer forgave his stupid excuses and went hunting down Wren. But, whoops, the doctor-turned-A-accomplice had vanished, leaving Shana to care for his place? Honestly, I’m just very confused about everything right now. Poor Emily always receives the brunt of A’s most vicious attacks, from cars through the window to nearly being sawed in half whilst inside a chained coffin. Luckily the girls rescued her in time–HA! Kidding!–I mean, Red Coat shut the assembly line off in time for Emily to safely escape. In the first not-so-surprising twist of the episode, the girls realized there were TWO red coats running around, and Aria caught up with one, none other than Cece Drake, and proceeded to beat the crap out of her before Cece accidentally fell over a ledge. As the girls comforted Aria, Cece’s presumed-dead-but-really-alive body up and sauntered away. Luckily, A Number Two led Spence to the real A lair, where the girls found expensive computer surveillance equipment, storyboards of the girls’ lives, and a closet full of MEN’S SUITS. As creepy Mrs. Grunwald confirmed to the liars, Alison was indeed alive and running scared; she’d been contacting the clairvoyant sorority mother for help seeing who her stalker was (remember, A also tortured Alison), and Mrs. Grunwald was the one who pulled Ali out of a shallow grave, where the poor girl’d been buried alive. And someone led the liars to the real lair and proceeded to watch them from behind a poster, and, judging by the unseen creeper’s eyeball, they were female. Don’t worry, I’ve saved the worst for last: Guess who’s A suspect numero uno now? EZRA FITZ. Yep, in a surprising but not welcome cliffhanger, Pretty Little Liars revealed Ezra had been watching the girls, then throwing a fit inside the lair after realizing his hideout had been discovered. Of course, this might be a fakeout a la Toby, Spencer, Mona (sort of–she still seems to be on the A-team and was once evil), etc. At this point, is anyone in town NOT helping A commit crime and murder and various other small-scale acts of terrorism? Seriously, there’s some sort of town-wide evil conspiracy junk going on in Rosewood. On the plus side, the Halloween episode looks like it’ll be genuinely good (and, besides, the summer finale acts more as a penultimate episode to the real finale that is the show’s excellent Halloween episodes anyway), and HOW AWESOME DOES RAVENSWOOD LOOK!? That thirty-second preview was the best part of the episode, seriously. And that’s it, see you in October! This entry was posted in Pretty Little Liars, Television and tagged ABC Family, PLL, Pretty Little Liars, Television. Bookmark the permalink. Agreed…I was hoping for a much better episode, especially after they hyped it for so long. But, I’m still looking forward to the Halloween episode. Those never disappoint.